The Sun is the symbol of life and light, for the power that always is generously given without reducing itself. The Sun will shine and give light to the earth to make all life possible. 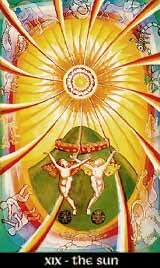 So the Sun stands for vitality and optimism, the blossoming of our nature, and is a sign that we have overcome the time of darkness and are ready to enjoy the light. But the Sun also has its negative aspects. Never forget that without the depth of water, the sun will create a desert.